"One may hope that the ideological fervor disappears, but sad to report, it remains strong all around the world, and even with the defeat of the ISIS territorial caliphate, we see the threat spreading to other countries," Bolton added. The Trump administration strategy also shifts the focus to Iran, characterizing the country as the foremost state sponsor of terror across the globe. 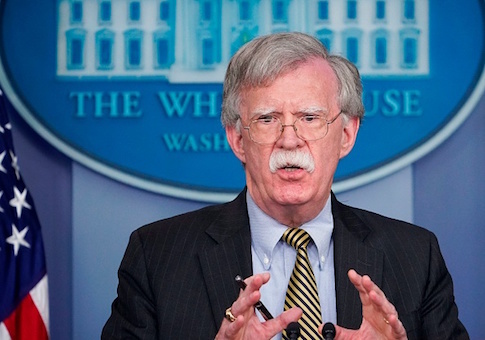 "The United States faces terrorist threats from Iran, which remains the most prominent state sponsor of terrorism that, really, the world's central banker of international terrorism since 1979," Bolton said. "And from other terrorist groups. Iran-sponsored terrorist groups such as Lebanese Hezbollah, Hamas, and Palestinian Islamic jihad, continue to pose a threat to the United States and our interests." The focus on Iran also represents a striking departure from the Obama administration's strategy, which sought to moderate Iran via the landmark nuclear deal and other diplomacy aimed at rewarding the Islamic Republic for moderation efforts. The United States will also take greater steps to pursue "terrorists at their source" by destroying them militarily, as well as with international sanctions aimed at choking off their funding. Additionally, it focuses on "protecting U.S. infrastructure and enhancing preparedness, countering terrorist radicalization and recruitment and strengthening the counterterrorism abilities of our international partners," according to the White House. President Trump, in discussing the new strategy, also emphasized efforts to counter Iran. "I ended United States participation in the horrible Iran deal, which had provided a windfall for the Islamic Revolutionary Guard Corps and its proxies, funding Iran's malign activities throughout the world," Trump said. In outlining what it calls "a new approach," the White House said it would actively combat "all terrorists with the intent and ability to harm our country." This includes both a military prong and other efforts to counter the spread of radical ideologies. "America First does not mean America alone," the White House said in a preview of the full strategy guide. "The new strategy commits us to expand our partnerships at home and abroad to encourage partners' assistance in counterterrorism activities," including with NATO and other allies. This entry was posted in National Security and tagged Terrorism, Trump Administration. Bookmark the permalink.